Is your business on the fence about getting started with social networking? Are you overwhelmed by the choices of tools available and do not know where to start? 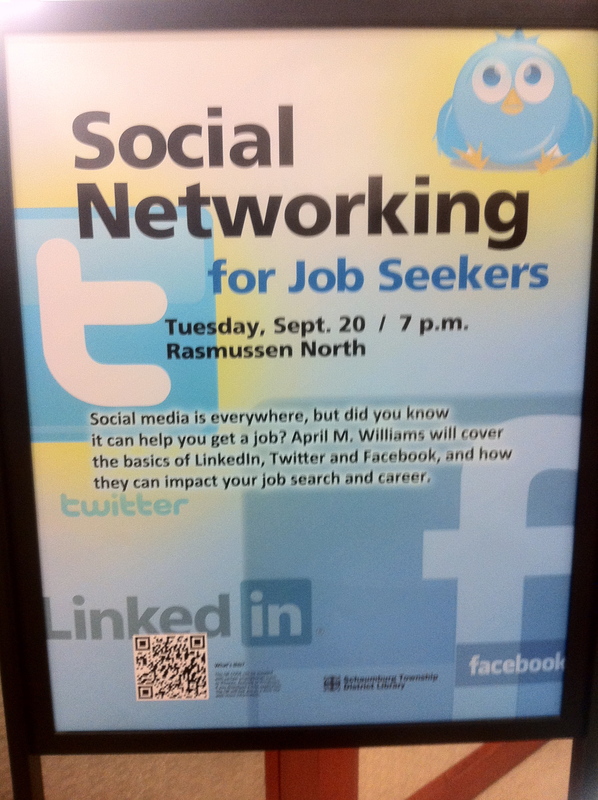 If so, the Schaumburg Library is the place to be on October 25 at 7PM for this “Social Networking for Business” session. Social networking coach and trainer April M. Williams will give an overview of the most effective free social networking tools available for businesses to engage with customers. You will leave with tools to build your brand and begin a dialog with prospects. Learn how to promote yourself and sell your “stuff” to new customers. Social media is made up of a variety of online tools which provide a place to communicate and network. Learn about the different types of social media and how they can be used to expand your customer base from expert April M. Williams. • What is social networking? April M. Williams, a nationally recognized speaker, author, coach and blogger actively leverages the power of social networking tools. April is President of CyberLife Tutors and shows clients how to leverage their strengths to enhance their business. Williams is the author of “Social Networking Throughout Your Career” and has been featured in major publications including the Wall Street Journal, Project Management Institute, Savvy, Business Journal, Nations Restaurant News and CBS Chicago News. Contact the Schaumburg Library to register for this free session and arrive early to reserve your seat. The last session April led at the Schaumburg Library so well attended it was standing room only. The Schaumburg Library is located at 130 South Roselle Road Schaumburg, IL 60193. Would you like to use your club website and social media tools to drive Toastmasters or other club membership? These free tools work both for individuals and club leaders. Using Your Website and Social Media to Drive Club Membership. How is you club or group using social media to get the word out? David Reed and Oak Brook, Illinois Toastmasters club hosts a presentation with speaker, author, blogger and coach April M. Williams on February 22, 2011. The Oak Brook, Illinois Serious Speakers Toastmasters club will feature April M. Williams and her presentation on “Facebook Your Toastmasters Club PR Friend” to build membership and your career. Attendees will see how their club can harness the power of these tools to recruit new members and retain current members. David Reed, MIM(MBA) is Toastmaster of the Day for this event from 5:30 to 6:00 pm at the Republic Bank in Oak Brook (2221 Camden Court). “All are invited to hear this wonderful and educational speaker,” David said. Is your group looking for a keynote speaker for your upcoming professional, community or corporate event? April is available to speak for corporations, associations, public seminars and events and industry-specific trainings. Topics can be customized. Hear what attendees are saying about April’s presentations http://bit.ly/April_Speaks. For booking information call 414.502.7745.